Morticed and tenoned softwood timber frames for canopy and retractable up and over garage doors. Constucted from planed timber with eased edges, they come with loose stops and are pre-treated with timber preservative to protect against rot. The legs are mortice & tenon jointed into the crossbar and left over-length for cutting exactly to site on site. May include some finger jointing to maximise stability. Available in 70mm x 70mm and 70mm x 90mm. When ordering 70 x 90mm frame, please specify whether 90mm is the face dimension or the depth dimension. Ordering size is INTERNAL frame dimension. 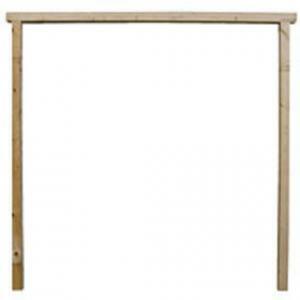 Cedar garage door frames and hardwood door frames can only be ordered with Cedar Doors or Woodrite doors. Cedar and hardwood (please specify) are the same price. Cedar is ideal for timber doors upto 9ft wide, as it will match the door perfectly. Over 9ft wide, the cedar is too soft to take the weight of the door via the fixings, so a softwood or hardwood frame should be purchased instead. Cedar and hardwood frames come as standard in basecoat or can be fully finished to match the door that is being purchased.